"Go Away Little Girl" is a popular song written by Gerry Goffin and Carole King. It was first recorded by Bobby Vee for Liberty Records on March 28, 1962. The lyrics consist of a young man asking a young attractive woman to stay away from him, so that he will not be tempted to betray his steady girlfriend by kissing her. The song is notable for making the American Top 20 three times: for Steve Lawrence in 1962 (US number 1), for The Happenings in 1966 (US number 12), and for Donny Osmond in 1971 (US number 1). It is also the first song, and one of only nine, to reach US number 1 by two different artists. "If You Love Her Tell Her So"
In late 1962, Steve Lawrence released the second recording of this song (Bobby Vee recorded it first in March 1962). The single reached number one on the Billboard Hot 100 in January 1963 and remained in the top position for two weeks. This recording also spent six weeks atop the U.S. Easy Listening chart. It also went to number 1 on the New Zealand Lever chart and number 18 in Canada. Mark Wynter's 1962 cover of the song on the Pye Records label also made the UK Singles Chart, reaching number six in Britain. 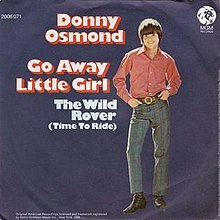 "The Wild Rover (Time to Ride)"
(1971) "Go Away Little Girl"
(1971) "Hey Girl" / "I Knew You When"
Donny Osmond's cover version of "Go Away Little Girl" reached number one on the Billboard Hot 100 chart on September 11, 1971. It remained in the top position for three weeks. Osmond's version also went to number 36 on the Australian Go-Set chart. It was certified Gold by the RIAA on October 13, 1971. Marlena Shaw does a version called "Yu-Ma/Go Away Little Boy" from her 1977 album Sweet Beginnings. This reached number twenty one on the Billboard R & B chart staying in the Top 100 for eleven weeks. In the 1980s it became a popular UK record on the Rare Groove dance scene. ^ "Cover Me: Same Songs to Hit No. 1 By Two Different Artists". Billboard. Retrieved 10 February 2010. ^ Whitburn, Joel (2002). Top Adult Contemporary: 1961-2001. Record Research. p. 141. "The End (At the End of a Rainbow)"